One interesting side-effect of using the iPad as a primary device is that I find myself accumulating keyboards. I consider it of great benefit that the iPad isn’t fixed to a keyboard. I can pick it up and use it all by itself which is largely the point of an iPad. For that reason I will not buy a case that requires the iPad be clipped into it in anyway that is not very easy to remove. The most I want for protection is Apple’s Smart Cover which can easily be pulled off. I want the iPad as light and thin as possible. For the first six years that I owned an iPad I almost always used it in a case with a cover. Once I started using it without covers I started using it more as it just feels better that way. All that said I also use an external keyboard with the iPad for 50% of the time and I’m finding that having multiple keyboards handy. At the moment all three of those are Logitech Keyboards. My least used of the bunch is the Logitech Keys-To-Go which is great for taking on the road. If I’m going to spend an hour working at the library or coffeeshop all I take is the Keys-To-Go, and iPad in the Smart Cover, that’s it. No bags or cases. Super light and thin but my least favorite to type on as there’s no backlight and very little key travel. It really takes some getting used to. Also, it shows more wear than I think it should for the amount it has been used. In particular the fabric covering, what seems like a kind of rubber, has come a bit loose and bubbly which you can see in the image. When working at home or outside on the deck I’ve been using the K811 as my primary keyboard. It’s a great keyboard to type on and has backlighting. When I’m using the K811 I’m also using a stand of some kind for the iPad. It’s a two piece arrangement with the iPad in the folded Smart Cover (or one of the other stands I’ve got) and the keyboard on a desk or on a lap board of some kind. The benefit of this arrangement is that the iPad can sit off to the side or up on a stack of books closer to eye level. Basically, anything goes and it changes based on my comfort. But last week I decided to pick up the Logitech K480 which has a greater front-to-back depth and includes a slot/stand for an iPad or iPhone or both. It’s fairly heavy compared to the other two because it also serves as a stand. This is not a keyboard that I’d take to a coffeeshop for light typing. But for working at or around the home it is my new favorite. That said, at 1.8 lbs, it is still light enough that I would take it on the road if I were expecting to do more than a couple of hours of steady typing. It’s not so heavy that I can’t easily put it into my travel bag with the iPad. Like the K811 the K480 allows for pairing with multiple Bluetooth devices and easy switching between 3 of them. In the case of the K480 there is a handy dial for switching and it works nearly instantly. I currently have it paired to the iPad and iPhone. When the 12.9″ iPad is updated I’ll be getting that and will pair it as well. It won’t fit into the slot in landscape mode with this keyboard but it will work in the portrait orientation. Not sure how stable it will be. If it doesn’t work well with the larger iPad I can pair it to the Mac or AppleTV. Regardless, I expect that it will primarily be used with my current Air 2. The K480 is a great keyboard for the iPad. The typing experience is excellent and the iPad is very stable when sitting in the keyboard slot. I can have it in my lap at any number of angles based on lighting and my comfort. Over the past three days I’ve used it to type a 20+ page podcast transcript. During that time I’ve used it in my lap on my futon, on the arm of an adirondack chair, in a camping chair in my lap, and in the front seat of a mini-van. In all situations it has allowed for excellent viewing and typing angles while remaining very stable. Due to the weight of the keyboard, the depth and angle of the slot, I can lean it backward or forward and the iPad stays put. It balances with the same stability of a laptop. Carrying from location to location while leaving it in the slot feels very safe. The only downside is that because it sits so deeply in the slot I cannot activate the swipe-from-bottom Control Center without first lifting the iPad out of the slot a bit. Or, I find that I can swipe up from the bottom left or bottom right corner which will bring up the centered arrow that allows for swiping up Control Center. Not terribly inconvenient but not as easy as a single action swipe up. Yeah, first world problems. One last negative, minor but worth noting: while the K480 feels like a solid, well made keyboard, it does have a very loud creak to it when picked up or moved around. It’s the sound of plastic flexing and the two pieces of the keyboard rubbing against one another. It’s certainly not a deal breaker but it is loud enough that the people in the room with me noticed it when I adjusted the keyboard on my lap. It’s also a bit loud to type on but I expect a certain amount of sound from a keyboard. Until Apple releases a 2017 update for the larger iPad Pro I suspect that the majority of my typing will be with the Air 2 and K480 though it’s nice to have the option of pulling the iPad out to use freehanded or with any other keyboard in any arrangement that best fits the situation. This entry was posted in iPad Journal and tagged Bluetooth, Keyboards, Productivity on April 18, 2017 by . I had a meeting/tutoring session with a client a couple days ago. She needed two things. A bit of work done to trace/vectorize a painting that she did which was to be put on t-shirts and other items as well as tutoring on how to go about doing that. She is retired but has a history in art, a mix of sculpting and some painting. But nothing digital. So, no experience with Adobe or any other. I suggested she start with Affinity’s Designer and Photo apps. After a bit of discussion she agreed and we purchased both for her. Then we spent the next 2.5 hours turning her scanned artwork into a primarily vector-based file using Affinity Designer. At the three hour mark she was ready to end the session and seemed very happy with the work we’d done. She wasn’t confident enough with the app to finish the job but we’d been doing the work on her laptop. In the past this would have just been an email with an attachment. But that seemed silly as I was right there with my iPad. An iMessage would have worked pretty well in this scenario too. I viewed it as an opportunity to show the client AirDrop because I correctly guessed that she’d never used it and was unaware that it existed. I used the Finder on her Mac to select the file on the desktop then clicked the share icon and pointed out the AirDrop option. She asked what that was for and I quickly explained as I carried out the action. I was prompted on the iPad to select iCloud as a save location which I did. The whole action was just a couple clicks and even easier than email. Of course I could have also accepted and saved the file via my iPhone. Really, this is a post about AirDrop and the benefits of a tightly integrated ecosystem. I’ve used AirDrop enough to know that it will always just work. There may have been a time in the early days when the process wasn’t so smooth but these days, at least in my experience, it always just works. Many folks still insist that the iPad needs more convenient ways to attach external storage. I’ve never needed it. Between iCloud, DropBox, and AirDrop I have everything covered with cloud storage and ease of transferring files. If I’m working with someone that uses Windows or Android we can use other methods. But, really, it’s not been an issue. This is the sort of thing that is easy to take for granted. As someone who has long worked with multiple devices, flawless peer-to-peer sharing is amazing and so convenient. I have no interest in USB ports for attaching external drives. A bit of an aside regarding this specific project that is worth mentioning. Ideally I would have liked to continue working on the file on the iPad and hopefully in the not too distant future that will be possible because the makers of Affinity Designer do have an iPad version in the works. When or if it will be available for purchase is unknown but I think this falls into the category of “Pro” apps that we really need more of for iPads. That said when I returned to my Mac I opened Astropad and had a go of using the iPad with a generic stylus in conjunction with AD on the Mac. It worked very well as a see where you are drawing style tablet, much better than the Mac with a mouse or trackpad. Going forward, I suspect I’ll make good use of iPad as a graphic tablet compliment to Mac-based work that involves drawing or painting. This entry was posted in iPad Journal and tagged AirDrop, Productivity on April 14, 2017 by . A new coffee and gift shop opened up in our small rural town and someone needs to inform them that the iPad is only for browsing the web and FB or maybe email. They’re making a huge mistake using it for actual work as a Point of Sale system. Yikes. 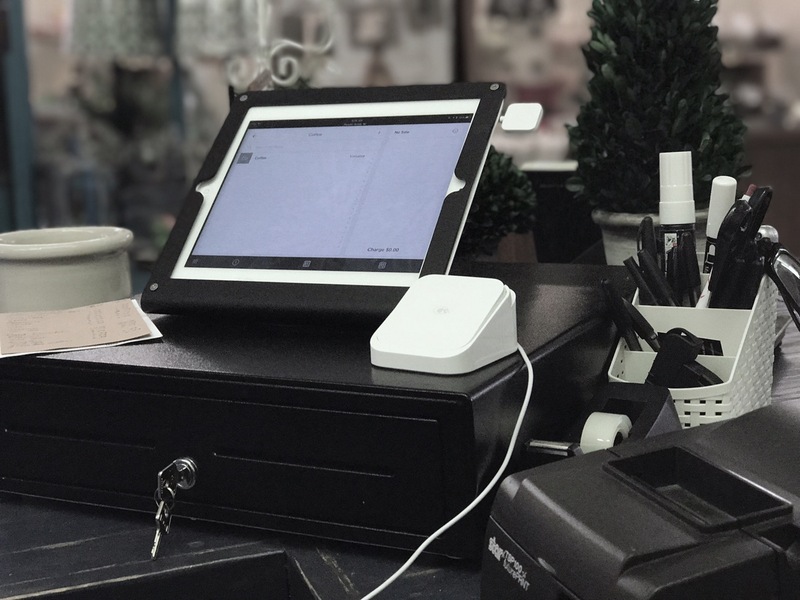 All kidding aside, there aren’t many places in rural Missouri that offer Apple Pay but thanks to the Square POS, Revival Trade and Coffee does accept it. That said, I don’t think many people around here are aware of Apple Pay or that they may have access to it if they want to try it out. That will change eventually. This entry was posted in iPad Journal and tagged Cash register, POS, Retail on April 13, 2017 by . Set-up a new website for Revival Trade and Coffee Company. This entailed purchasing domain, configuring account, setting up files on server, creating and editing raw code on html and CSS files using Coda. Image optimization via Workflow. Various file transfers to and from local Mac with Transmit. Used Transmit to retrieve a pdf from a server then marked it up for review by a client. Updated a website with new pdf content which was converted to jpg and web optimized. Converted another pdf to web optimized jpg for client use on social media. This entry was posted in iPad Journal and tagged Productivity, Web Design, Workflow on April 7, 2017 by . Yikes. Very disappointing. But I have to admit that I have very mixed feelings about Panic. I’ve used Coda and Transmit on the Mac for years. Now I use them on my iPad and they are two of my most used apps. They’re great apps. But here’s the thing, as much as I enjoy and use Panic apps there is this other thing that kind of bothers me. Take the statement above. Who the hell was using Status Board? My (admittedly vague) understanding is they started that app for themselves and used it in house. I may be mis-remembering that. But regardless, I looked at it and while neat I had absolutely no use for it. I don’t see how Status Board was a pro level app. Or, if it was, I don’t see why the failure of that one app should impact 3 other iOS apps that are most definitely “pro” apps and which I suspect have a much larger, more committed user base. Panic’s public face often seems silly to me. A year or so ago a big deal was made about their clever sign. They seem kind of squirrely in that they seem to get distracted by fun and otherwise cute projects. On a certain level, that’s great. Fun is good, whimsy too. But it just seems odd that they put that much time and effort into a sign with an iPhone app that people can use to change the colors of the sign and yet, a year later they are complaining about the time and energy investment in iOS apps not paying off. It seems odd. Meanwhile, Coda, introduced on the Mac in 2007, currently sits at version 2 which was released in 2012. That’s 5 years per version. Which seems a little long but not too bad. But based on Panic’s 2016 review and 2017 projection we should not expect Coda 3 anytime soon. I’m fine with that as I’m not using the Mac version much at all. But in the comments to their post was a link to a twitter thread involving a bug/missing feature in Transmit 4 (the current version). It was brought to their attention in late 2014 and while Panic replied steadily as time progressed the issue has yet to be addressed even though Panic first suggested they had a fix as far back as early 2015 and yet, two years later, that thread is still going and that issue is unresolved. That is poor form. And I’m sure it’s not the only example. Panic is one of those companies that has a sterling reputation in the Apple Nerd Herd and I’m conflicted as to whether it is deserved. It’s important to be realistic in our expectation. I often think folks are not very realistic in their expectations of Apple. Perhaps I’m being too harsh in my assessment of Panic. They’ve got a nice chart demonstrating how active they were in updating their apps over the course of 2016 and they were. A few new features but mostly lots of bug fixes. Looking at the release notes it was lots of bug fixes. That’s not to trivialize the updates because removing bugs is important (hence my comment in the previous paragraph). To reiterate, these are fantastic apps and they seem to be solidly supported. I suppose I just don’t understand their complaint about selling apps for iOS. It is they who set the prices. As of now it looks like Coda sells for $24.99 and Transmit is $9.99. In 2015 Coda was only $9.99 and was a free upgrade to those that had purchased the first version. That seems far too low to me and is certainly lower than the Mac versions. Why not bump up the price? I paid a good bit more for the Mac version of Coda and would happily pay more for the iOS version if it was asked and if it meant that Panic would be more committed to development on the iOS side of things. I’m not an app developer. I’ve not done a comprehensive review of the costs of iOS apps that are being built for and sold to professionals. I do think that the developers of professional grade apps such as Coda and Transmit should sell their apps at a price they think is fair for the product. If it’s the same price as that being asked for the Mac version then so be it. I know that a version of Affinty Designer is in being worked on and if it sells for the same price as the Mac version I’ll pay it. Again, I’ll pay it enthusiastically because it’s an app I want and need to make my iPad more valuable as a tool for my graphic design projects. This post seems a bit unfocused to me. It was Panic’s recent statement about selling “pro” iOS apps that set me off. Panic goes out of it’s way to share the many ways in which it is whimsical and it’s apps delightful to use. It’s evident in the design and presentation of the blog, the website, the apps. Whimsy is everywhere and it’s wonderful. But when it comes to pricing their apps, valuable tools that do indeed help professionals get real work done, maybe Panic needs to take itself and it’s user base more seriously. This entry was posted in iOS and tagged Apps, iOS, iPad, Panic on April 6, 2017 by .